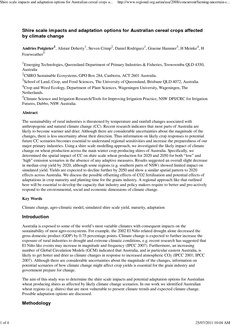 The sustainability of rural industries is threatened by temperature and rainfall changes associated with anthropogenic and natural climate change (CC). Recent research indicates that most parts of Australia are likely to become warmer and drier. Although there are considerable uncertainties about the magnitude of the changes, there is less uncertainty about their direction. Thus information on likely crop responses to potential future CC scenarios becomes essential to understand regional sensitivities and increase the preparedness of our major primary industries. Using a shire scale modelling approach, we investigated the likely impact of climate change on wheat production across the main winter crop producing shires of Australia. Specifically, we determined the spatial impact of CC on shire scale wheat production for 2020 and 2050 for both "low" and ‘high" emission scenarios in the absence of any adaptive measures. Results suggested an overall slight decrease in median crop yield by 2020, although some regions (e.g. southern parts of NSW) showed limited impact on simulated yield. Yields are expected to decline further by 2050 and show a similar spatial pattern to 2020 effects across Australia. We discuss the possible offsetting effects of CO2 fertilisation and potential effects of adaptations in crop maturity and planting time for the grains industry. A regional approach like that outlined here will be essential to develop the capacity that industry and policy makers require to better and pro-actively respond to the environmental, social and economic dimensions of climate change.